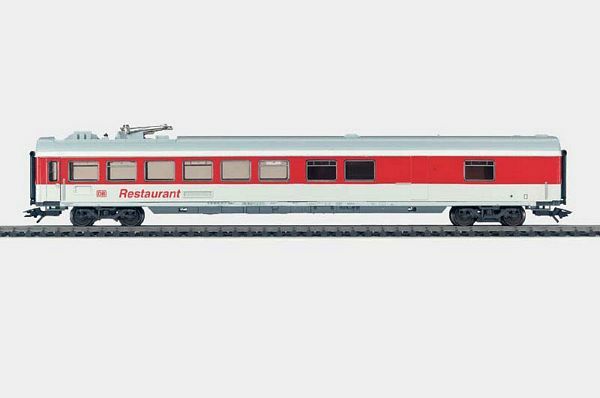 Prototype: German Railroad, Inc. (DB AG) type WRmz 135.0 InterCity dining car. Model: The car has adjustable buffers. The car is ready for installation of 7319 current-conducting couplings or 72020 current-conducting couplers. The car has a working pantograph. Length over the buffers 27.0 cm / 10-5/8. DC wheel set 4 x 70 0580. The pantograph on the dining cars provides uninterrupted power for the galley. This is important chiefly when the cars are on a storage siding or when the train's locomotive is being changed and there is no power available from a locomotive.